Are you in need of TV or Appliance repair service because one of them is broken? Before you rush out to buy a new one, call us. In most instances, a broken television can be easily and affordably repaired so that it is as good as the day you first bought it. Need Affordable and Reputable TV or Appliance Repair That You Can Trust? Get On The Schedule, Click Below! 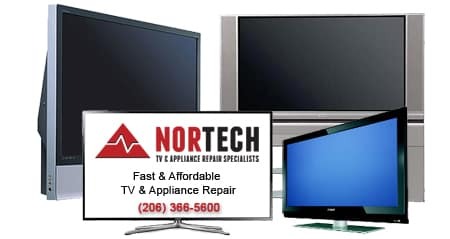 Nortech Electronics specializes in delivering prompt, friendly, and expert TV & Appliance Repair Service. We have been a family-owned business serving the Seattle area since 1989. We believe in treating our customers like family—with integrity, respect, honesty and attention to your needs. At Nortech, we aren’t satisfied until you are satisfied. So why wait? Call us today, and you just may be watching your favorite show in all its glorious color tonight! We are experts at TV repair. We are also very customer-centric in our approach to your TV repair. Call us first to be taken care fast! Broken appliances in your home raise the stress level. 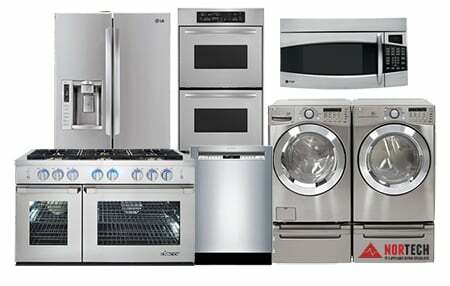 To cut the time you’re down, call us for appliance repair. We’ll do it right and fast! When you are running a business you need to get back up and running fast. Call us for expert commercial repair that gets done fast. Nortech is Licensed Electrical Contractor utilizing properly Certified Electricians to service, repair, install, or replace any appliance!